Modern American artist Robert Rauschenberg (1925–2008) is probably best known for his “Combines,” a term he invented to describe a series of works that present found objects on canvas and therefore combine aspects of painting and sculpture. Art critic Jonathan A. Anderson and theologian William A. Dyrness address the religious references that proliferate through his oeuvre, and that of many other late nineteenth- and twentieth-century artists, in their book Modern Art and the Life of a Culture: The Religious Impulses of Modernism* (Downers Grove, IL: InterVarsity Academic, 2016), part of IVP’s Studies in Theology and the Arts series. The following excerpt is taken from pages 308–9. Robert Rauschenberg (American, 1925–2008), Untitled, ca. 1955. Oil, paper, fabric, and newspaper on canvas with string, nail, funnel, and wood, 31 1/2 × 25 1/8 × 9 in. (80 × 63.8 × 22.9 cm). San Francisco Museum of Modern Art. Rauschenberg’s Untitled black painting with a funnel (c. 1955) is presented as a kind of figure: the open circular collar of a t-shirt positions a head relatively high in the field, and the fragment of a sleeve on the right-hand edge indicates a lifted hand. Nearly all of the collaged scraps of cloth and paper on the surface are painted over in flat black paint—one of the few portions that is not is a prayer card just to the right of the center of the painting that displays a reproduction of Carl Bloch’s Doubting Thomas (1881). 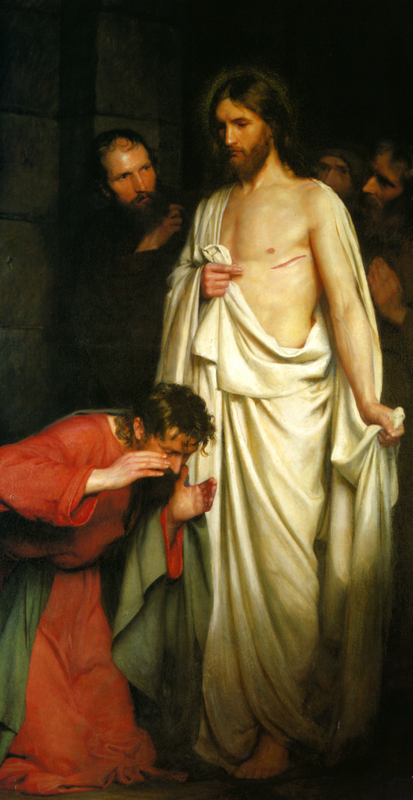 Flurries of red, yellow, green and white paint have been slashed across the surface immediately below this image (the only place such color appears in the painting), which within the figure suggested by the cloth fragments correspond to the position of the wound in Christ’s side, as depicted in the prayer card. The painting’s surface subtly stands in for the wounded body of the resurrected Jesus, and as such the ball of twine placed in the funnel on the left side of the panel becomes doubly suggestive of incarnation (descending downward into the funnel) and ascension (being pulled upward out of the funnel). But if Rauschenberg is allegorizing the surface of the painting with the resurrected body of Christ, then he is also placing himself (and the viewer) in the position of the incredulous Thomas. It is a painting that powerfully articulates both a longing to touch and see (Lk 24:39; cf. Lk 6:19) and the persistence and seeming ineluctability of doubt in the age of modernity (including doubt that images, much less paintings, can any longer serve as vehicles for the kind of religious touching and seeing that we long for). Like much modern art, this is not a work of unbelief as much as it is of fragilized belief, one that is caught oscillating (or struggling) between doubt and belief. * This is an Amazon affiliate link, meaning that Art & Theology will earn a small commission on any purchase that originates here.